Louis CK and Al Franken to test their trivia skill on Jeopardy! 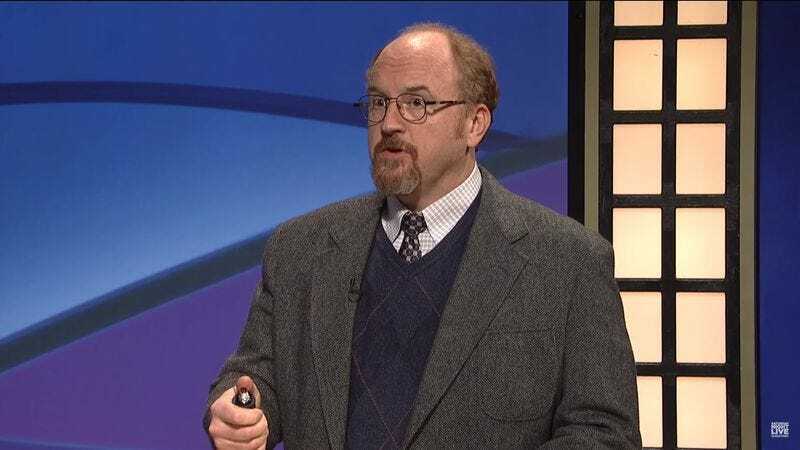 Back in 2014, comedian Louis CK appeared on a fictional game show called Black Jeopardy! when he hosted Saturday Night Live for the second time. This spring, he’ll have a chance to test his wits on the real thing as one of 15 celebrity contestants on Jeopardy!’s 2016 “Power Players Week.” The episodes—to be taped in front of a live audience at Washington’s DAR Constitution Hall on April 9 and then aired between May 16-20—will bring together an impressive assortment of “pundits, personalities, and politicians” playing for charities of their choice. This year’s lineup (subject to change, of course) includes Anderson Cooper, Mad Men creator Matthew Weiner, and SNL alum and current Minnesota senator Al Franken.